Shipyard workers in Japan have ordered in a batch of magenta paint which will go on an NYK ship under construction for delivery in April next year. The new look ship, a far cry from NYK’s traditional black hulls, is part of the new brand of the Ocean Network Express (ONE), the merged liner line up of NYK, MOL and K Line, due to start operating next April. 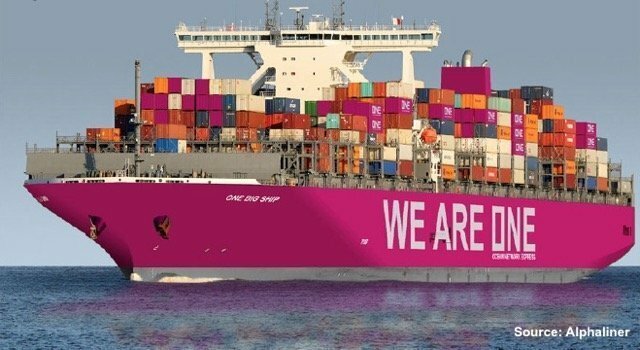 Analysts at Alphaliner have produced a mock up of what NYK’s tenth 14,026 teu vessel from JMU’s Kure Shipyard will look like, becoming the first newbuilding to sport the new magenta colours. The “rather eye-catching livery” as described by Alphaliner fits in with the new line’s mission statement to offer special, innovative services. While the magenta hulls will definitely stand out, they are not the first ships to opt for a pink look. 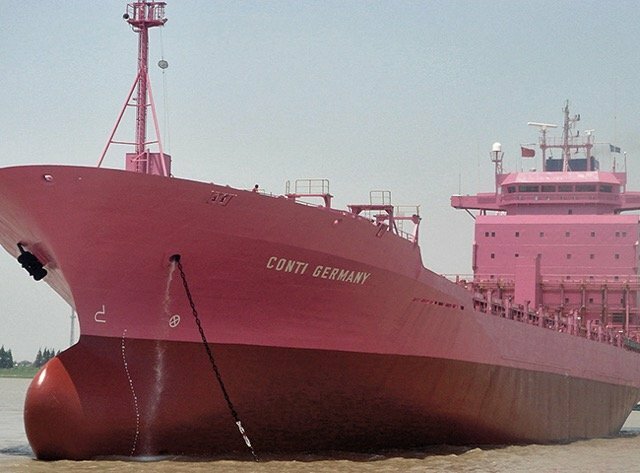 Germany’s Conti Reederei turned heads more than a decade ago with its choice of a pink livery for a swathe of ships.